We're used to seeing all kinds of trends on the runways, but leave it to Gucci's own Alessandro Michele to bring us the most avant-garde ready-to-wear collection yet—and we're only talking about the shoes. 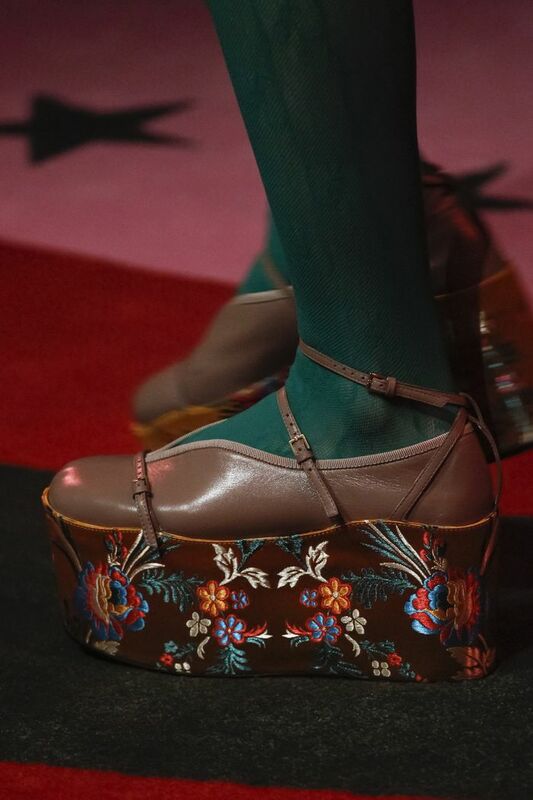 They may not look sensible, but we're sure the strappy platforms paired with everything from socks to embroidered tights lined with bows are meant to be functional—at least by Gucci standards. Here's why: These heels become practical flats when the straps are unbuckled, so you're getting two pairs in one. We don't know about you, but this is our idea of sensible. (Think of how many times you've wish you had on flats instead of heels or vice versa. Problem solved!) There's even an embroidered platform style whose coordinating flat is a mule, the style that's become synonymous with the Italian brand. Don't be surprised to see these on every It girl's feet come spring, because the wear-with-everything hybrid style is what every fashion girl has dreamed of. Check out a few of the remarkable platforms that turn into flats, straight from the Gucci runway below. What do you think of these flat-platform hybrid shoes? Tell us in the comments, and shop the current accessories in Gucci's fall collection.